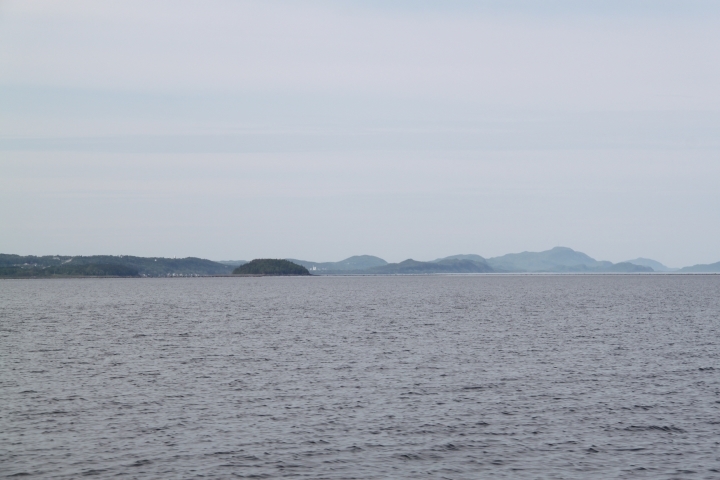 Left Rimouski at around 08:30 with two other boats, Old Hand and Slinge ‘N. Wind quickly turned foul and waves were building to 3 and 4 feet. Very unconfortable. Decided to stop at Pointe aux Cinelles for the wind to turn. Slinge’N had engine trouble and had to anchor under sail! Anchoring under sail. Mike to the rescue. Here is Old Hand waiting for the wind to change. 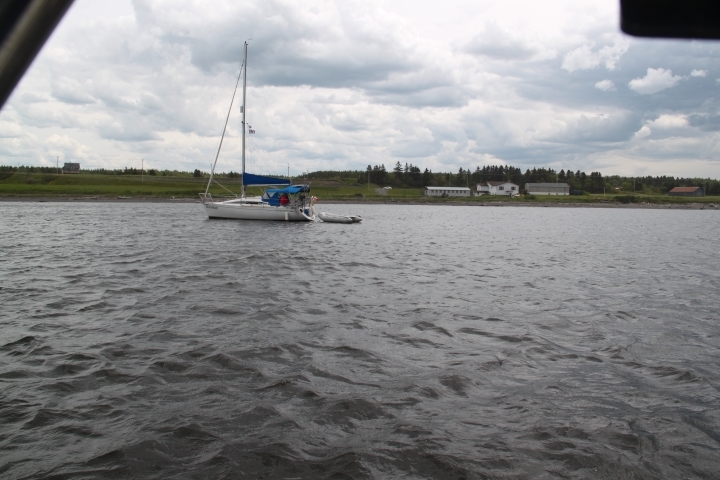 Well we had lunch at anchor and everyone decided to head for Matane around 16:00, about 30 nm away. Should have been a 5 hour or less sail if the weather held. Unfortunately the wind turned again and we were battling 5 – 6 foot seas. Well be arrived around 21:30. 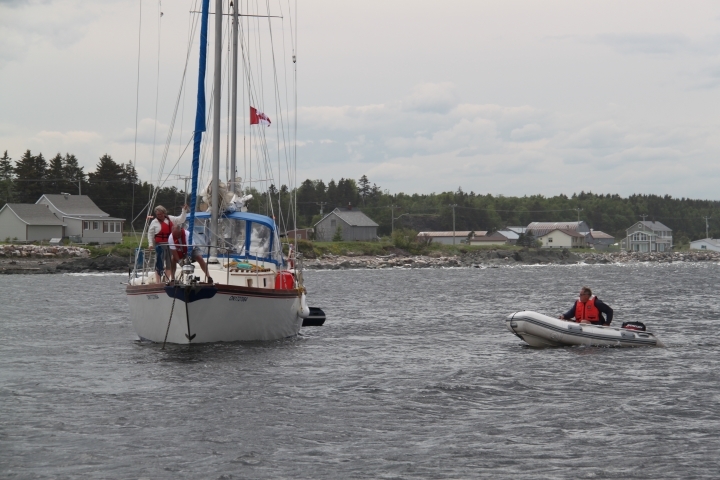 The entrance to the small craft harbour was a bit tricky getting into and we were now abeam of the waves. Very roley. Once in the entrance things smoothed out but the entrance to the yacht club was just before a bridge and I turned too soon. AGROUND again x&%^@!! OH well, within 15 minutes the tide had us up and floating again. Old Hand found the docks and advised us to go farther east. Great….we got in and tied to the dock around 22:30. What a long day. 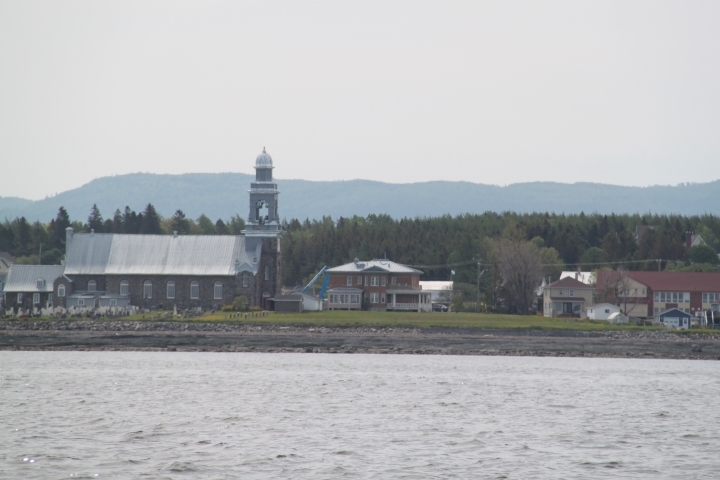 One of the many churches along the shore. South shore St. Lawrence river. Today we travelled 48.6 nm. 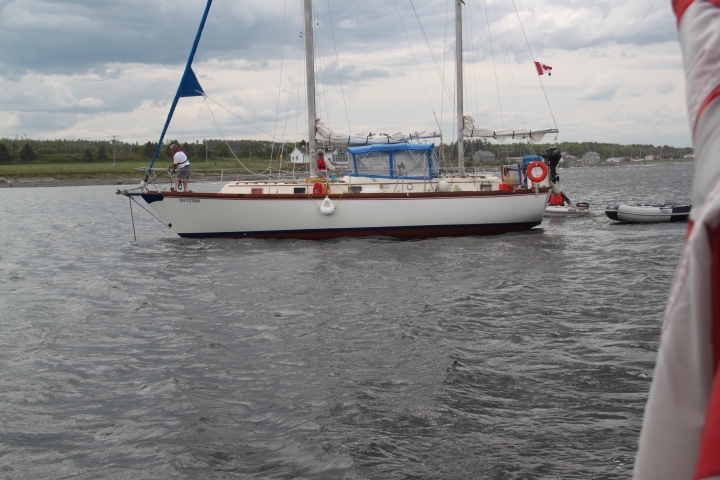 My Dad sailed our first big sailboat Snoopy down from Qc and was sick much of the way!! The big rolling waves are very common.. Yuck! Wow – long day! The rewards will be well worth it though in the end!!! Nice that you found a few other cruisers to stick with – that always helps – especially when something goes awry. To infinity and beyond for the crew of the Persuasion!!! Hi Mary Beth!!!! Hope Mike let’s you give a woman’s point of view for some of these posts. Would ❤ to read it. Oops – was excited to post the last comment – oopsie – Mary Ellen – Mary Ellen (darn Waltons show must have been stuck in my head when I typed out your name ). LOL just been told by the web master I’m posting my comments to fast – how dare they chastise me for being a speedy key puncher!!! Oops – was excited to post the last comment – oopsie – Mary Ellen – Marry Ellen (darn Waltons show must have been stuck in my head when I typed out your name ). 1136h EDT, Saturday, MarineTraffic shows you still in Cap-Chat, so I’m guessing either MarineTraffic isn’t picking up your signal, or you’ve got your hands full with both MaryEllen and Mary Beth on board. Marine traffic does not have global coverage.